The Mechanical Joining module is specifically designed for the simulation of mechanical joining processes. It allows for the numerical computation of technologies primarily based on joining-based forming. Therefore, various riveting procedures, such as punch riveting, self-piercing riveting or blind riveting, can be analyzed. 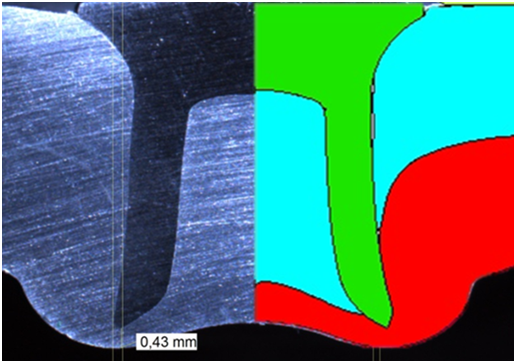 It is also possible to simulate the connection formation in diverse joining by shearing and upsetting or clinching technologies with a fixed or an opening die. Furthermore, special effects such as high joining speed (e.g., when setting bolts) or a high momentum (e.g. flow-drill screws) can be taken into account. An analysis of adhesives in the joining zone is also feasible. Simufact Forming Mechanical Joining contains a library of CAD descriptions of your joining tools and elements and automatically calculates the specific connection parameters. Furthermore, this module offers a specially adjusted simulation set-up. Simufact Forming Mechanical Joining is a tool that enables you to simulate an entire virtual process chain. 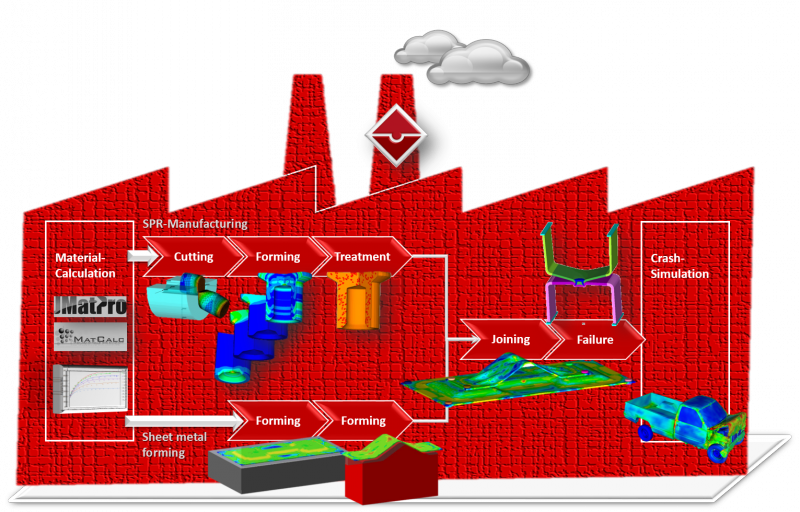 Both the manufacturing of the joining elements themselves, as well as the forming of metal sheets, can be accounted for in the joining simulation, in effect providing a Virtual Joining Factory. All mechanical joining techniques are characterized by a large number of parameters that influence both the quality of the joining results and each other. Experiments alone are not adequate to analyze and quantify these parameters. Through numerical simulation you are offered a range of diverse and unique opportunities for choosing the appropriate technique and its set-up. Apart from calculating the properties that define quality, it is also possible to visualize material flow during manufacturing, as well as to compute the necessary joining force. The simulation can indicate tension states that form in the tool during joining, which allows you to estimate tool durability. It is also possible to examine the influence exerted by high speeds and adhesives as demonstrated by the example of the RIVTAC® process. In the past, two-dimensional calculations sufficed because mechanical joining was primarily a question of axial symmetry. However, for joining requiring several joining points, three-dimensional models must be constructed and calculated. With three-dimensional simulation it is possible to examine the interdependency of joining points, to optimize the sequence of joining, to analyze element distortion and to minimize its effects. Additionally, the calculation of process-related effects during joining also becomes feasible. For example, differing stiffnesses of the C-frame leads to spring back during the joining process, which can significantly affect the results. The eccentricity of the joining punch or a joining element in relation to the die, or die tilt, influences the formation of the connection, but can be predicted by three-dimensional analysis. Simufact Forming Mechanical Joining allows you to work from the results of previous virtual processing steps. This enables you to account for previous changes to the material, such as residual stresses. The option to simulate the whole process chain greatly increases the quality and usefulness of the predictions made about the manufactured results. The Mechanical Joining application module can generate a 3D model of the virtual joining point for different load cases (e.g. lap shear, coach peel and cross tension) with only a few clicks. A comparison of cross-sections, from experiments and simulations, show a precise match between the virtual prediction and reality. This striking illustration was calculated with just a few iterations. Afterwards, numerical variants can be calculated with the same high-quality simulation without further comparison to a real-life experiment.